One of the highlights of attending the RWA national conference is the opportunity to discover new authors. When historical romance author Theresa Romain found out that I had not read any of Rose Lerner's books she was determined to introduce me to both the author and her works. I am so grateful that she did! 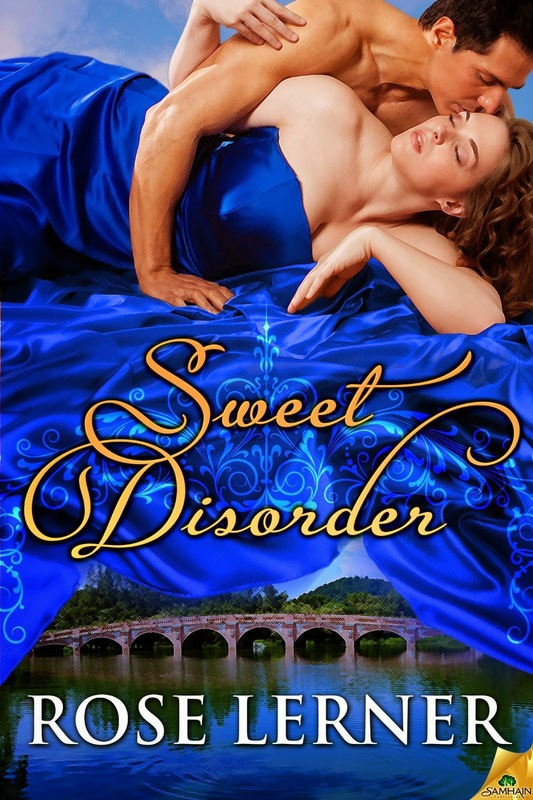 Coincidentally, at the same time I was reading Lerner's wonderfully original A Lily Among Thorns, our regular reviewer, Janga was naming Lerner's Sweet Disorder as one of her top books for the first half of 2014. Rose graciously agreed to visit us today and answer questions from both of us. For more information about Rose and her books, visit her website. PJ: Hi Rose! It was lovely to meet you at the RWA conference and is a pleasure to welcome you to The Romance Dish. On September 2nd, Samhain released your previously published historical romance, A Lily Among Thorns in digital format. Please tell our readers what they can expect from this book. It was wonderful to meet you too! A Lily Among Thorns is a London spy story about an embittered ex-courtesan innkeeper who must team up with a kind-hearted, unconventional chemist to save her business (oh yeah, and England) in the weeks leading up to Waterloo. Readers can visit my website to find out more, read the first chapter, and/or buy the book. I've also written a short story about the hero's little sister to accompany the rerelease. It's set just after the end of the book and it contains spoilers! Check it out after you've read the book. PJ: When will the book be available in print? Samhain typically releases full-length stories (i.e. not novellas) in print a year after the initial digital release. So Lily will be available as a trade paperback in September 2015. PJ: In A Lily Among Thorns, you have created a refreshingly atypical heroine and hero. What inspired you to venture outside the traditional historical romance box with these two? How did they convince you that they belonged together? Thank you! At the time I started this book, a very common trope in Regencies (especially traditional Regencies like the Zebras and Signets) was the unreadable hero with an unexplained but extensive knowledge of the London underworld. His emotional wounds were usually healed by the unconventional but fundamentally innocent heroine and her unconditional acceptance of him. I loved those stories, and I really wanted to swap the hero and heroine and see what happened! It was Joan Wolf's wonderful The Gamble, for instance, that inspired Serena being on a first-name basis with every rogue in London. Janga: What attracts you to the cross-class romance? I could probably write pages just about this! But here's one part of it: I have a very clear memory of going to...I think it was the Brooklyn Museum, and there was an exhibit with Victorian corsets on display. I must have been about four, and I had never seen a corset before and I was kind of freaked out by it. My mother told me, "Don't worry, no one in your family ever had to wear one of those, they were peasants." Whenever I expressed my hatred of cabbage, she'd say, "Cabbage kept your family alive in Europe for hundreds of years." I've always been aware of my family stretching back into the past as poor people. So when I read a historical romance about dukes and duchesses, that's a background obstacle to suspending disbelief: really while all this is going on I'm somewhere else eating cabbage. For me, cross-class romance is like time-travel romance or the type of sword-and-sorcery fantasy where someone falls through a portal/mirror/laundry chute into a magical realm: one of the protagonists is kind of weirded out by what's going on, and that gives me a very compelling entry point into the story. Janga: I love the level of detail in your books. How much research do you do? Janga: Your books are an interesting blend of romance conventions and elements that push the boundaries of the genre. Is this a conscious choice or just the way your stories play out? One of my favorite things about genre fiction is how our books are in conversation with one another through the ways we choose to tell similar stories. I really love playing with tropes. Sometimes that means "I will never get tired of this and I'm going to just roll around in it," and sometimes it means, "Oooh, I love this and I can't wait to try it this way," and sometimes it means "I've seen this a million times and I hate it and I want to do the exact opposite." It's like macaroni and cheese: sometimes I just want the basic stuff, and sometimes I want it with salami and ground-up cauliflower and Peppadews, and I won't ever, ever put blue cheese in it unless it's a tiny sprinkling of mild Gorgonzola, but at the end of the day, I'm just making mac and cheese. PJ: On your website you mention that you enjoy cooking. Let’s say the chef at Serena’s inn has taken ill and you’ve been recruited to cook the evening’s special. Tell us about the entrée you would prepare and, most importantly, what’s for dessert? You have no idea how much time I spent agonizing about this. What if I mess it up and the reputation of the inn is damaged?? I settled on roasted chicken because it's hard to mess up roasted chicken if you don't totally forget about it. At a fancy Regency dinner there were usually a lot of sides, so I'd probably do quick-pickled vegetables, some kind of apple compote, maybe a salmagundi (a big plated salad with lots of different ingredients), and a simple soup like peas or lentils that doesn't need to have a clear broth (fancy chefs take their clear broth VERY seriously). And for dessert...maybe a pudding? Or a trifle, those are pretty foolproof. When I cook at home, some of my foolproof desserts are rugelach (a traditional Jewish cookie), chocolate pudding, or this tequila-soaked lemon sorbet from Martha Stewart. Except I leave off the lime zest and sprinkle some coarse salt on there instead. Even easier! Janga: What authors most influence your writing? Georgette Heyer and all the Regencies I read in high school were a huge formative influence. Nowadays a few of my auto-buy historical authors are Tessa Dare, Meredith Duran, Courtney Milan, Cecilia Grant, Lauren Willig...I know their stories create echoes in mine. My critique group, especially Susanna Fraser, have taught me a lot about writing. I also read and write fanfiction, and I was intensely involved in fandom in the two years between when I wrote the first draft of In for a Penny and when I revised and sold it. Because the stories were mostly short, I was able to try lots of different things (as a writer and as a reader). And it's a gift economy. So I learned to take risks in a way I don't think I would have if I'd been worrying about sales and editors and reviews and all that. I got tons of feedback on my own work and I had the chance to beta read for some very talented writers. So from my fellow fanficcers, I learned an enormous amount about the kind of love stories I like and don't like, and about what works for readers. PJ: What would readers be surprised to learn about you? I can't think of a good answer to this! Readers, is there something you want to learn about me? I'll probably tell you if you ask. PJ and Janga: What’s next? True Pretenses, the second book in my Lively St. Lemeston series (Sweet Disorder was the first), will be out January 13th. It's about a Jewish con artist looking for a rich wife for his beloved little brother, and a philanthropist heiress who needs to get her hands on her dowry in a hurry. I had a ridiculous amount of fun writing it, and I can't wait to share it with everyone! PJ: Thank you for visiting with us today, Rose! Would you like to ask our readers a question? What is your favorite foolproof dessert? 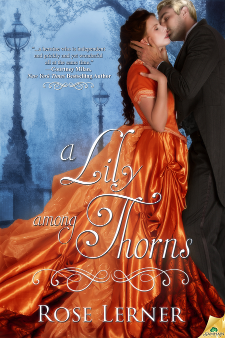 One randomly chosen person leaving a comment on today's post will receive an e-book copy of A Lily Among Thorns. 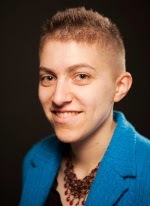 Rose is also running a contest at her website. To link to the website contest, click here. Warning: Contains elections, confections, and a number of erections. Fabulous interview, and Rose, I am in awe of the composed and erudite manner in which you handled the probing questions from our skilled inquisitors. Is humour an important ingredient for your stories? My favourite desert .... other than trifle of course .... would be Tiramisu where I add a dash of rum or sometimes more. My critique partner Alyssa Everett came up with that warning because she is very witty! I think humor is important to my stories because I prefer (and try to write) stories that are a mix of humor and intense emotion. If it's just one or the other I find that my emotional palate gets jaded and I lose the ability to laugh or cry. For example I saw a review of Snowpiercer that complained the movie couldn't decide if it was a zany comedy or a tragic social commentary, but that's exactly why I loved the movie, because it was both at once. My favorite foolproof desert is Banana Pudding. I use miniature Vanilla Wafers, homemade whipped cream, and lots of bananas. When I take it to a potluck, I bring home an empty dish. Ooh, that sounds DELICIOUS. Do you usually bake it with the meringue on top or stick to the layered pudding? I stick to the layered pudding, very traditional Southern. The real whipped cream just takes it over the top. Such a great interview, PJ and Rose! And I eagerly await True Pretenses. Sweet potato pie is a favorite with my family and friends, but my favorite fool-proof summer dessert is strawberries, blueberries, and raspberries layered with whipped cream. No hot kitchen required and guaranteed sighs of appreciation. It looks pretty in parfait glasses too. Thanks for such awesome questions! I do sweeten the whipped cream with a couple of tablespoons of sugar--granulated or confectioner's. Mix butter, potatoes, sugar and milk until well blended. Add vanilla, eggs, and spices; mix well. Pour into prepared pie shells. Bake in a 350° oven for about 1 hour. You can serve it plain or top with a spoonful of whipped cream on each slice or sprinkle with toasted pecan bits. Makes two pies. Ooh, thank you! I can't wait to make it...which is good timing since fall is finally here. You're an important part of that interview too, Janga! Ooh, thanks for the recipe. I love sweet potatoes. Definitely going to make that one! Your book cover is gorgeous. As to desserts chocolate fudge pie, very easy to make and oh so yummy. Isn't it beautiful? I looooove the colors, it's so fire-and-ice! Ooh, that's another pie I've never made! Recipe?? And do you think I could use a graham-cracker crust? Mmmm..... Lots of good dessert ideas! I drove into the city to have lunch with friends today. Lunch was delicious but I decided to be a good girl so no dessert. Mmmm, mousse! Chocolate mousse is one of my all-time favorite foods, especially with wine. Cheesecake!!! Congrats to Rose on her releases :) lol... Now I want desert! For family gatherings, ice cream and all the sundae fixings are a foolproof favorite, especially for the little ones. Rose, I've enjoyed Sweet Disorder and In for a Penny. I look forward to reading A Lily Among Thorns. Thanks for visiting. Thanks for stopping by, LSUReader! I'm still trying to figure out how I managed to miss Rose's books the first time around. She has such a wonderful writing voice! I love a good ice cream sundae. My favorite is vanilla ice cream with caramel and hot fudge toppings sprinkled with chopped walnuts. Yum! My fool-proof dessert is either cheesecake or chocolate pie. Cheesecake or cheesecake bars. I personally don't care for it, but others do. I prefer a peanut butter cookie or brownie.